Brandsmart is a wholesale retail marketplace where you can purchase products. 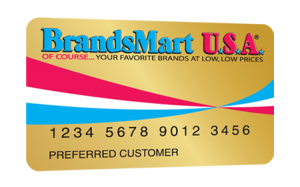 The Brandsmart Credit Card is a great credit card to establish credit or rebuild an existing credit issues. If you fell on some hardships in the past then this might just be the credit card you can try to make an impact on your credit. This means if approved you will have access to the Brandsmart shopping website with the ability to purchase directly from this retailer. Take a look at all the name brand Brandsmart products. If this sounds like something you are interested in then review the Brandsmart Credit Card Application. You can use your Brandsmart credit card at the store and online. They have many name brand products like APPLE and SAMSUNG. Available zero percent financing for new accounts. APR is 29.99%; Minimum Interest Charge is $2. Existing cardholders should see their credit card agreement for their applicable terms.